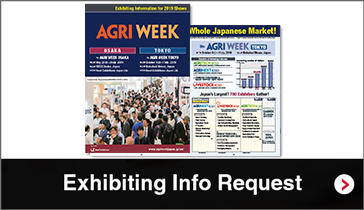 What is AGRI WEEK TOKYO? Industry professionals gather from all over Japan. Consisting of 4 shows: 9th International Agricultural Material & Technology Expo Tokyo (AGRITECH TOKYO), 6th Next Generation Agriculture Expo Tokyo (AGRINEXT TOKYO), 4th Farmers’ Processing & Sales Support Expo Tokyo, and 1st International Livestock Supply & Equipment Expo Tokyo (LIVESTOCK TOKYO). A large number of industry professionals such as agricultural corporation, agricultural cooperatives, and industry new entrants from East Japan will visit the show and active business dealings will be held with the exhibitors. All kinds of livestock supplies and equipment under one roof. 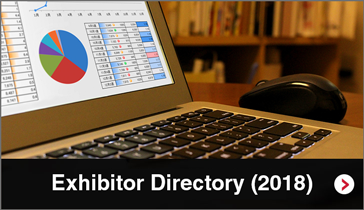 Exhibiting details, floor plans and participation costs are available on request. Show details and exhibit profile. 2018/02/26　Our website has been renewed! 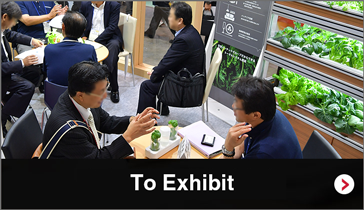 Japan's largest* garden and horticulture industry trade show! Home centres, retailers, wholesalers, landscapers, constructors visit the show and have active business meetings with exhibitors. Japan's leading hardware and tool industry trade show! Tools for constructors, carpenters, landscapers are exhibited. Work shops, home centres, garden shops, hardware shops, and professional users visit the show. Consisting of three shows; 3rd Int'l Agricultural Material & Technology Expo Osaka (AGRITECH OSAKA), 3rd Next Generation Agriculture Expo Osaka (AGRINEXT OSAKA) and 3rd Farmers’ Processing & Sales Support Expo Osaka.